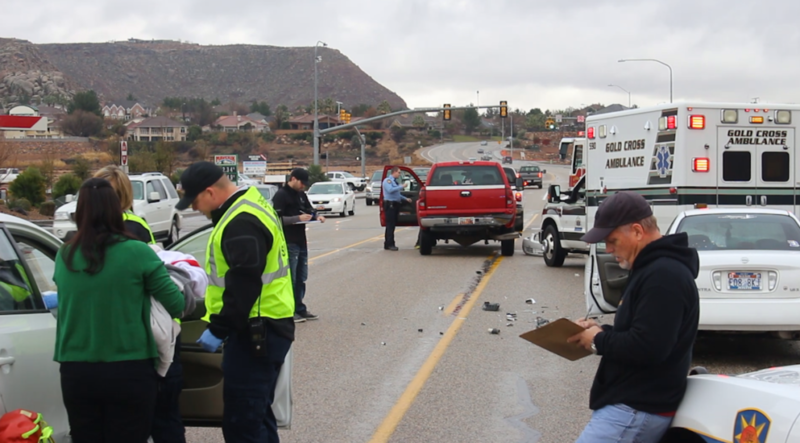 ST. GEORGE — Two people ended up in the emergency room Thursday following a three-vehicle crash in St. George which officials say was caused by a teenage driver who was distracted by her phone. 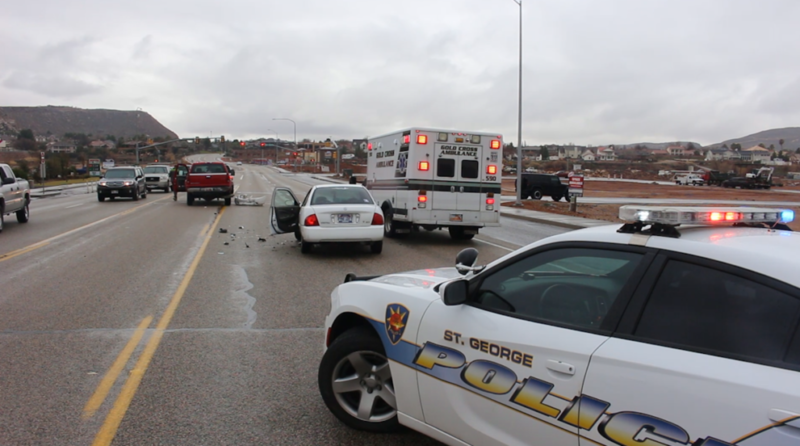 Police and emergency crews responded to the three-vehicle collision at 1450 S. River Road in St. George just after 11:30 a.m.
Three vehicles had been traveling south on River Road, approaching a red light at 1450 South, St. George Police Officer Dave McDaniel said. 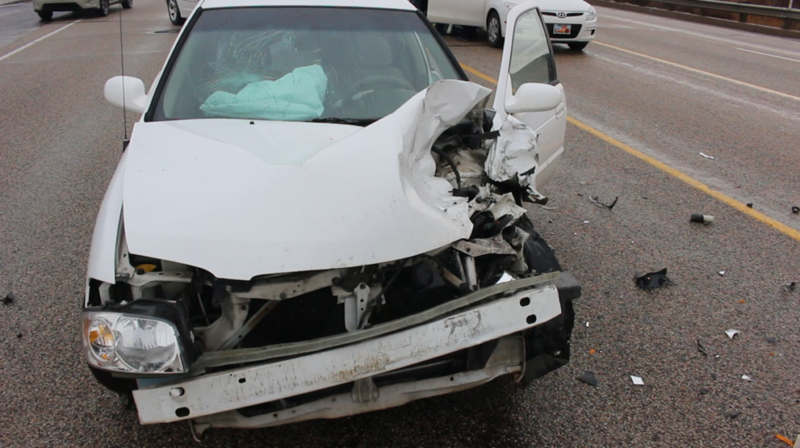 A white Ford truck was stopped in front of a red Chevrolet truck as the 17-year-old driver of a white Nissan Sentra approached the two vehicles from behind. There had been very heavy traffic just before the crash occurred, McDaniel said, but that didn’t deter the driver of the white Nissan from being on her phone. 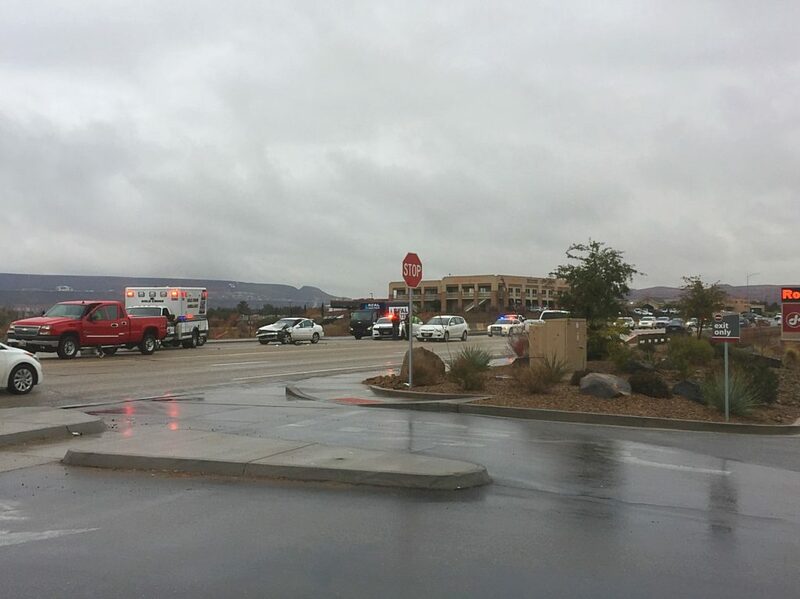 As a result of the crash, two people, who chose not to be transported by ambulance, were self-transported to Dixie Regional Medical Center in St. George, McDaniel said. 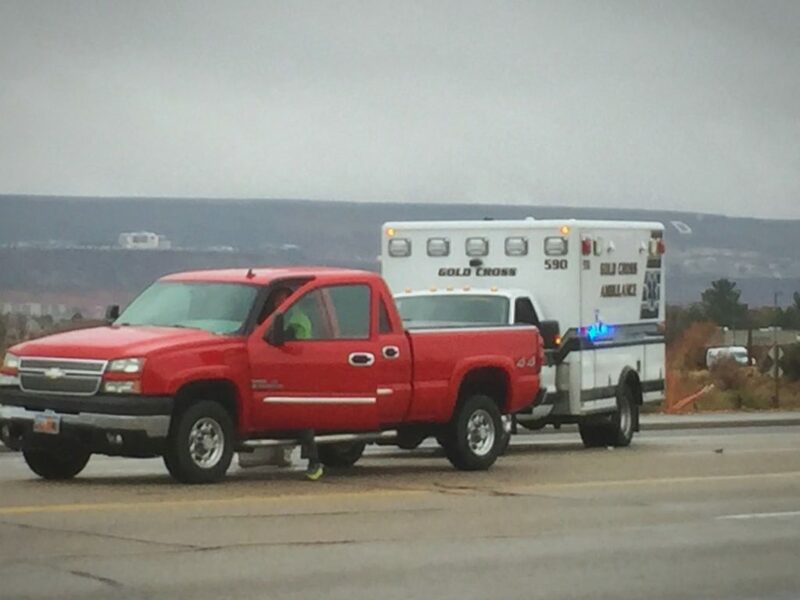 Traffic on River Road was slowed by the crash and, at one point, traffic was backed up to 900 East. 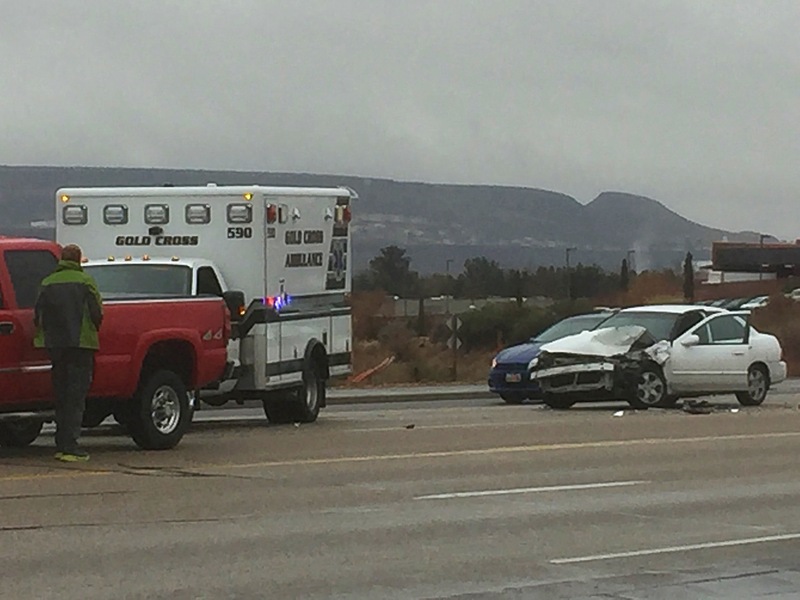 The white Nissan and red Chevrolet were rendered inoperable during the crash and were towed from the scene. 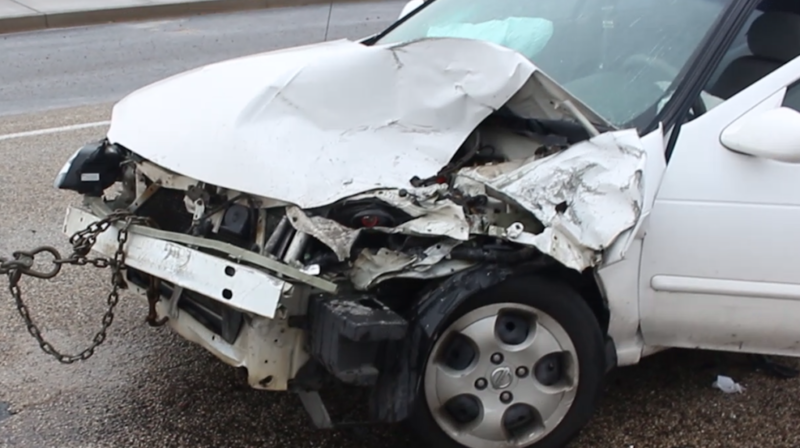 The driver of the Nissan was issued citations for following too close, careless driving and for using a phone while driving a vehicle under the age of 18. In Utah, drivers under age 18 are banned from using any kind of wireless communication device while driving, including all handheld and hands-free cellphones and text messaging devices as part of a law enacted in 2013. According to the Utah Highway Safety Office, drivers distracted by cellphones were 53 percent more likely to be age 15-19 compared to all drivers involved in crashes in 2012. Should be against the law for anyone, not just minors. And to this selfish little girl, I hope it was worth it. Just stupid. Don’t believe everything you read. The police aren’t always correct. They assume – a lot! Was the officer sitting there watching her use her phone? Probably not. If she wasn’t on the phone, her parents need to obtain cellphone records from their carrier and put that cop in his place. Maybe even file a law suit.